Have you started to carry out your plans for the hot and steamy summer vacation yet? 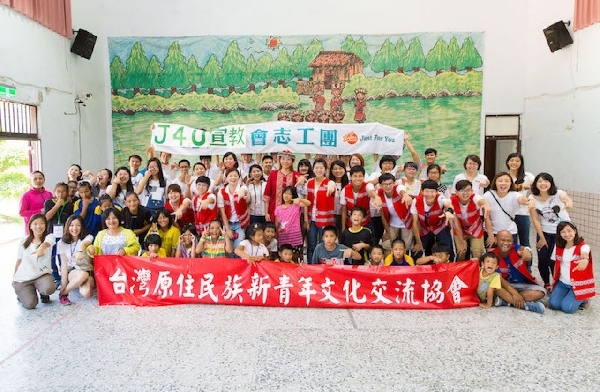 After the charitable road running held on June 25, in order to serve their aboriginal community, the J4U Volunteer Group of Christian Gospel Mission (CGM) extended their love to Ruei-bei Elementary School--- located in the Ruisui Township of Hualien County, and well-known for their soccer. By collaborating with the New Youth Aboriginal Nation Exchange Association (NYANEA), the J4U Volunteer Group carried out “Pakasial, Operation Harmony” with the same heart and mentality as Pastor Jung Myung Seok, the founder of CGM. Pakasial means “in harmony” in the language of the Bunun Clan. The volunteer group offered soccer activities, performing art classes and dance classes, according to the needs of the children. Based on the Bible verses in Isaiah chapter 11, which was to achieve heaven on Earth through love and peace, the volunteer group incorporated the animal stories of the Bible into the three-day and two-night summer camp and organized a series of fun-filled programs and activities. The programs allowed the children to experience the process of finding and discovering their own unique qualities. Even though the Ruei-bei Elementary School is within a remote township that is experiencing a shrinking population, a continuous decrease of students, an increase of single parenting, and intergenerational education issues, these problems have never stopped them from developing their soccer culture. With their faith in God, even many soccer national champions have come from this township. The 3-day and 2-night camp not only helped the children to develop soccer and art performance capabilities, but also taught the kids how to work together as a team to accomplish goals, how to treat one another with love, peace and support, and how to develop friendship. "It is the most precious thing,” said Cheng-chin Tung, the former principal of Ruei-bei Elementary School, and Director Chien-cheng Lin, “to hear the laughter of the children during the process and to see them cry upon parting.” The children’s responses also became the best repayment for the volunteers’ hard work and efforts. The CGM’s J4U Volunteer Group will continue to foster their love.